Yay, it's Friday! Do you have any plans for the weekend? It feels like the city is more alive because there are so many events going on. Today I plan on going to the museum to check out a dance exhibition and then Saturday I want to check out the Butterfly Pavilion. I'm going to trying to catch Iron Man 3 at some point too. With so many things to see and do, I hope you enjoy your weekend! I have another Emily de Molly to show you tonight. I wasn't planning on it but once I put it on, I could not take it off. This irresistible beauty is No Love Lost, a stunning red jelly with hex silver and gold glitters with a smattering of matte white square glitters. 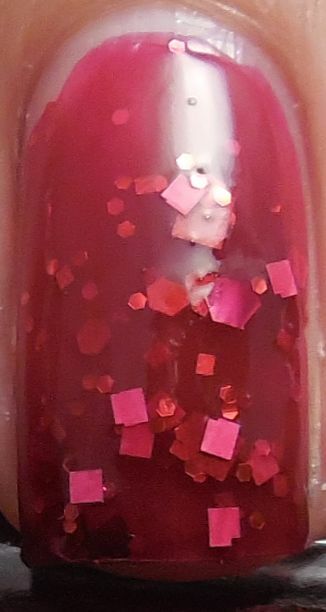 The red jelly base is perfect and opaque after two coats, but I used three in these pics because I wanted more glitter. There was some slight dragging of the glitters during application so you'll notice there may be more glitters towards the tips. This had a wonderful shine on its own but I finished with a layer of SH Insta Dri. I love the shade of this red. It leans slightly berry but once layered it turns true red. The glitters add depth to the jelly but honestly I would be happy to have the jelly alone. 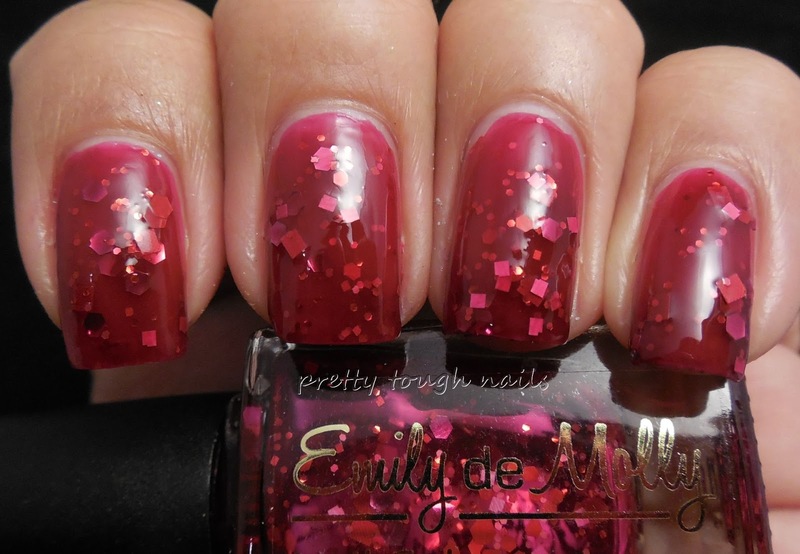 Don't get me wrong, the glitters are fabulous, especially the matte white squares, but that jelly is amazing. Don't you just want to squeeze it?? Gorgeous color! I love the square glitter in it.